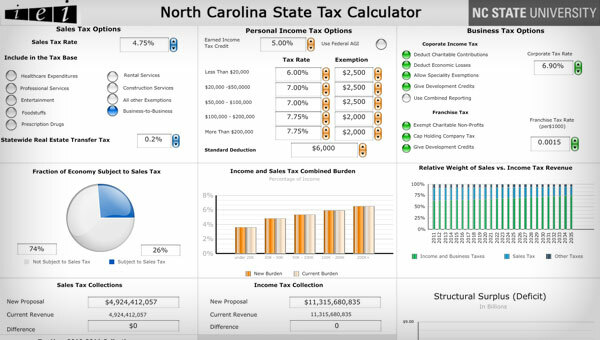 The North Carolina State Tax Calculator enables users to adjust elements of the three most important sources of state tax revenue—the sales tax, personal income tax, and business taxes—to experiment with different solutions to these problems. This fiscal toolset was designed as a client side desktop and ported to an online application that managed a large subset of Oracle data utilizing Crystal Reports and SAP Xcelius Dashboard integration. Try your hand at adjusting the various tax rates and bases and see how revenue changes affect the state’s long term deficit! Interested in learning more about North Carolina’s tax system? Visit IEI’s Financing the Future page for more information.